If you're invited to a party, always check in advance whether there will be food available. It may be that there are just a few nibbles, if anything at all. In which case, you may need to eat before you go, especially if you know that you'll be having a drink or two. If your diabetes is treated with insulin you can delay your injection until you are about to eat – you may need to have a snack such as a small sandwich at your usual mealtime to prevent a hypo. If you are uncertain about adjusting the timing of your injections, talk to your diabetes healthcare team for advice. If your diabetes is treated with diet alone or diet and tablets the exact time you eat isn't so crucial. 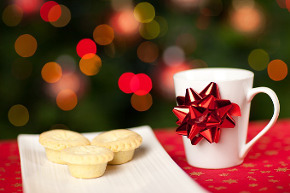 Read Diabetes UK's full guide to the Christmas season.